Are you getting tired of searching three or four different references for current information about Medicare? Are you tired of paying hundreds of dollars for books which have some, but not all, of the information you need? Now you can get all the important Medicare compliance information you need in a single, easy-to-use book at a very affordable price. 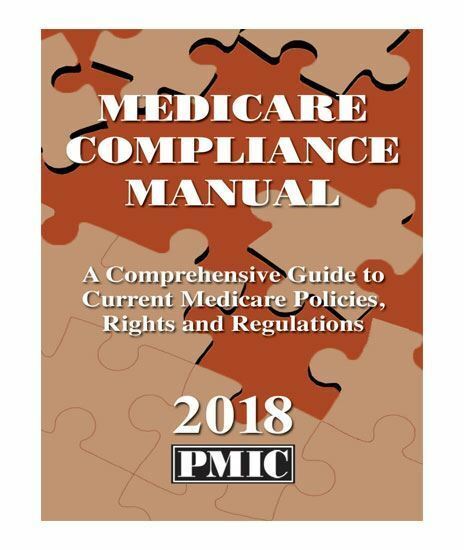 Medicare Rules and Regulations 2018 — a comprehensive listing of current benefit policies, national coverage determinations, claims processing, Medicare secondary payer (MSP), Medicare Program Integrity (MPI) and Physician Quality Reporting System (PQRS). Medicare Fee Schedule 2018 — the official 2018 RBRVS fee schedule as published in the Federal Register includes CPT™ and HCPCS codes, RVUs, global surgery periods, flags for multiple, bilateral procedures, assistant surgeon and billable medical supplies, and the official geographic practice cost indices (GPCIs). Medicare E/M Documentation Guidelines — the most current version of CMS evaluation and management documentation guidelines to help you protect your practice from audit liability.